The Walkley Awards for Excellence in Journalism are presented annually in Australia to recognise and reward the best in the craft. Finalists are selected by eminent journalists and photographers and overall winners judged by the Walkley Judging Board. The awards cover all media and have grown organically over the years, expanding to encompass the changing nature of the media industry and innovation in journalism. More than 1300 entries are received each year across 30 categories. The Walkleys also recognise excellence in longform journalism through the Walkley Book and Documentary awards. The Gold Walkley is the most prestigious award, chosen from all category winners. The Walkley Awards exist to recognise “creative and courageous acts of journalism that seek out the truth and give new insight to an issue”. They reward excellence, independence, innovation and originality in storytelling and distinctive reporting. This can be through research and investigations, well-crafted and innovative presentations, news-breaking single stories and engaging, entertaining and/or informative reporting. Whether you’re a longtime entrant or a newbie, make sure you review the category descriptions, terms and conditions and FAQs before you enter. All entries must have been published/broadcast in Australia in the 12 months from Sept. 1, 2017, to Aug. 31, 2018. The Nikon-Walkley Awards for Excellence in Photojournalism recognise visual journalists producing still photography for any platform. Criteria include storytelling, courage, public impact, creativity, innovative use of technology, technical ability and resourcefulness and can include soundslides and photofilm. Outstanding Contribution to Journalism (chosen by the Walkley Directors): Recognises the achievements of a person or group for outstanding or enduring commitment to the highest standards of journalism. Each year, the Directors recognise the achievements of a person or group that has demonstrated an outstanding commitment to the highest standards of journalism – truth, rigour, integrity, fairness – over a lifetime. Chair of the Walkley Judging Board Angelos Frangopoulos said: “Last year we undertook a major review and introduced changes to the Walkley Awards that we described then as ‘evolutionary, not revolutionary’. 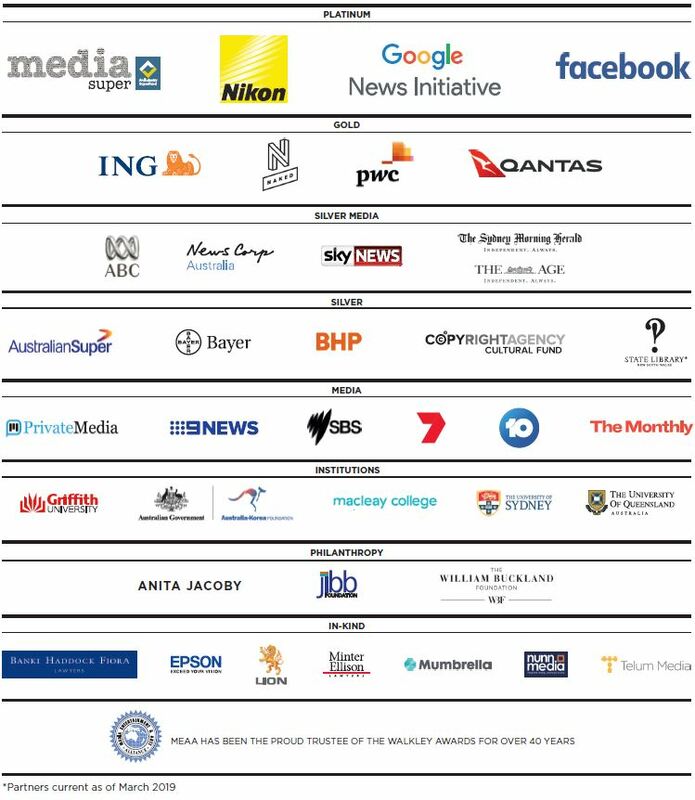 It was all about making sure the Walkley Awards really do recognise the best of what you do, as technology and platforms change but the fundamental values of journalism stay much the same. International stories are eligible to compete in almost all Walkley categories, and they compete strongly. In 2017 international stories won seven of the 30 Walkley award categories including the Gold.